A message about UML on the Cocoa-Dev mailing list led me to discover Pixelglow's port of Graphviz for Mac OS X. It's a very Mac-like version of AT&T's automated graphing software. 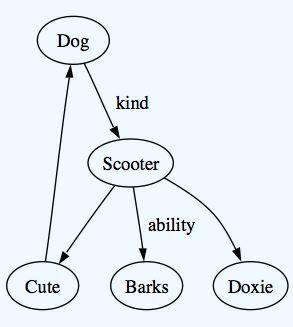 There looks to be a lot of power in the app, but in a nutshell you define the graph using a simple syntax and then Graphviz creates a high-quality rendering for you. Here's a meager example where I describe a little bit about my dog, Scooter. So, while fun, what might I do with this? There are lots of layout options and chart types, some of which might lend themselves to incorporating data from my home automation system. Or, a more natural tie-in might be with Tinderbox. While Tinderbox has plenty of interesting graphical views built-in, tapping into its export feature to create Graphviz charts (which are of higher resolution and easier to tweak) might be quite powerful. Anyone care to take this ball and run with it? We'd love to see a photo of Scooter the Dachshund!